Cool colors such as blue are considered to be restful, calming, and serene. If you’re looking to create a peaceful and calming environment, blue is a safe bet. Blue is also an intellectual color, representing trust, logic, communication, and efficiency. Consider using blue as the primary color in areas that require high levels of focus and mental clarity. Green is another cool color that is considered restful. Green is actually the easiest color on the eyes, since the eye focuses the color green directly on the retina, there is no adjustment needed and it is less straining on your eye muscles. Because of this scientific fact, green proves to be a great fit in offices where people work long hours. Green also provides balance and represents harmony, nature, and restoration. Yellow is typically thought of as the color of happiness. It represents a variety of positive emotions including creativity, friendliness, confidence, and optimism. If you are looking to stimulate positivity, creativity or happiness, consider incorporating the color yellow into your workspace. Red is an exciting and physical color. Because of its strong energetic and intense effects, it is a great color choice to use in spaces that demand physical exertion. Orange blends the effects of red and yellow, creating a color that is warm, happy, and energetic. 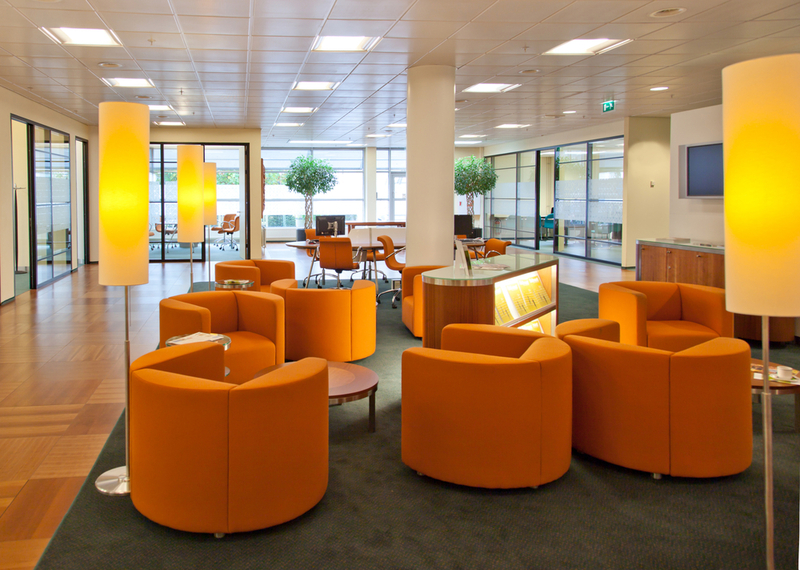 Orange is a fun and social color, and is an appropriate color choice for a casual office lounge for your staff to interact with each other. 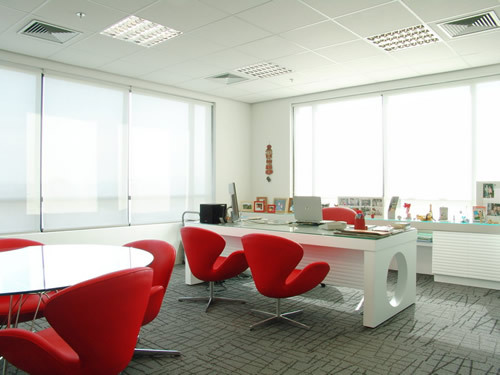 If you find yourself feeling inspired, or needing some assistance when it comes to designing your residential or commercial workspace, contact us today. We have a team of dedicated and experienced designers waiting to meet you and help you design the space you’ve always dreamed of!